Japanese retailer Mamegyorai has posted up pre-orders for the first two Blade Runner 2049 action figures by NECA. 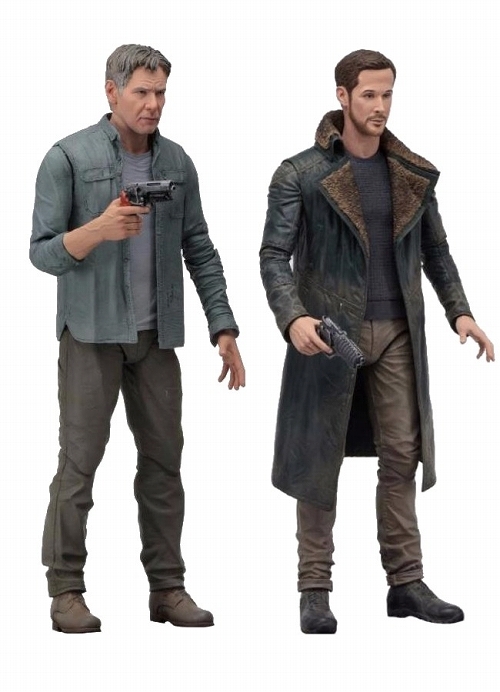 The figures include stellar versions of Harrison Ford as Rick Deckard and Ryan Gosling as Officer K. The 7″ scale figures are based on the sequel to the classic Blade Runner, a Ridley Scott film that changed the face of science fiction themed action films. In the new movie Officer K is on a mission to find former Blade Runner Deckard, who has been missing for 30 years. Together, they look to thwart a plot that could plunge what’s left of a fragile society into utter chaos. According to the pre-order listing, the figures are due for release in August. We’ll have more info an images as they become available. Click the thumbnail for a larger image. The other one, not so much but I'd have to see a better picture. I'm glad it doesn't look like Gosling. I hate that guy. I'll probably get a bunch of these for customs. The bodies are awesome in a generic, civilian way. Hell yeah for more custom fodder! Ford looks incredible. 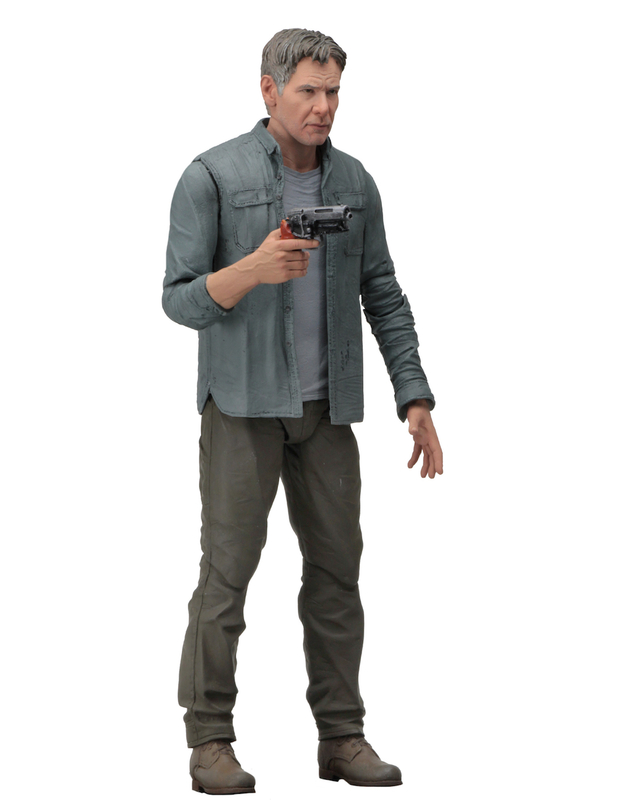 I can sort of see a hint of Gosling in there, but it's like they chose the dumbest looking screencap of him to model the figure after or something. His forehead (and top of his head in general) looks huge and his facial expression is so dopey. Paint his face green and his hair black and he'd make a good Leader from Marvel. Hah i actually laughed when i saw the man standing next to ford. Probably a bad photo or a prototype. 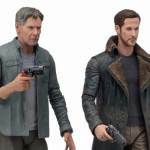 I'll be switching their heads for an updated Rick Deckard figure, Gosling's head and Ford's body go in the trash. Man, really hope this means there's hope for merch based on the original film! On Twitter Randy said the license is only for the new movie but there's a possibility they're negotiating to get the original too, that would be awesome. Ford does look great. I do like the Gosling body better, that Jacket is cool. A head swap for sure. Higher resolution images & official details. That looks nothing like Ryan Gosling. As others have stated, it's probably just a prototype, but seems strange that it appears as though Ford's head likely turns on a ball joint, whereas Gosling's head and neck look like one solid piece. Harrison Ford: "What costume will I be wearing in the movie?" Director: "Nah, just come in whatever you're wearing now. That's fine. And we borrowed Bane's jacket for Gosling, so we're all set." If they can do these, what're the possibilities of seeing figures from the original Blade Runner? I'd love a Deckard and a couple of Roy Batty! it appears as though Ford's head likely turns on a ball joint, whereas Gosling's head and neck look like one solid piece. That really freaking annoys me. I hate it when manufaturers do that I mean show some love to the collectors who support your freaking company. They did that with the Old Man Logan figures in Legends. They made some weird giant ball joint with the obvious intent of preventing head swaps. Really frustrating. That Harrison Ford likeness is perfect, almost looks like a picture of him. I don't really have a need for the Gosling figure, but that outfit is very cool! I'm hoping they have Jared's likeness, as I am a fan of his. I was a huge 30 Seconds to Mars fan at one point (particularly the first 2 albums)and Jared in this movie just looks like himself as opposed to the weird Joker look he had. So that would be a must buy, along with Harrison Ford. All in all, I'm very excited to see how far NECA takes this license. I would love to see some Cinemachines! Calling it now harry gets wasted. I'm definitely getting that Deckard figure! And Ryan I'm definitely not getting him if he looks like that. Don't like the guy anyway. But here's hoping that Neca Gets to the original movie. I would love a Original Rick, Roy, Pris, Rachael, and Leon. That is a really good likeness of Ford! Not sure I'd have much use for a figure of a frumpy guy working in his garage though. Tim, why don't you like Ryan Gosling? The dude is an amazing actor. I feel like some people think he never did anything but the Notebook. He built an incredible and respectable career. With that said, his head sculpt better be an early prototype. All times are GMT -4. The time now is 8:25 AM.